The Thin Man. Metro Goldwyn-Mayer 1934. I’ve heard the popularity of Nick and Nora Charles is in their banter. As this is not the version that left that out (that would be the Broadway musical…), I’m looking forward to it. The writing must be up to it, or it wouldn’t have been and still be popular. This is an early example of heavily sequelized films, all with silly titles that probably belie their lack of purpose. 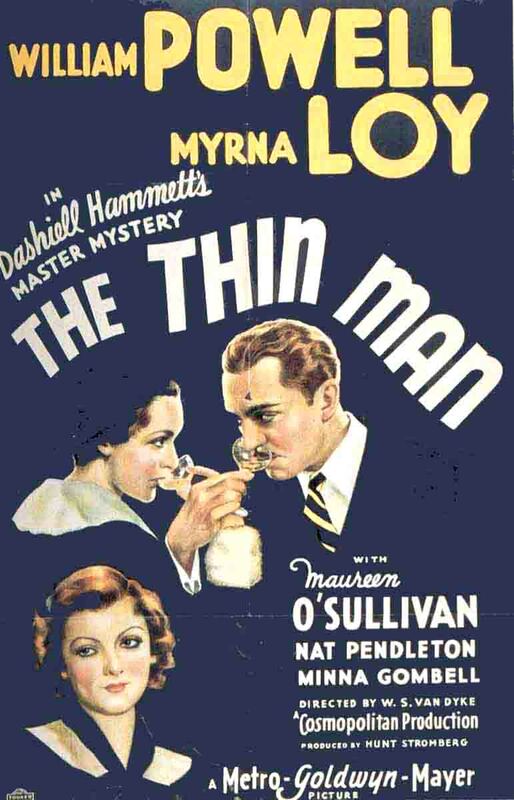 If you thought today’s sequels were pointless, you haven’t heard of The Thin Man Goes Home. I’m at a loss for what else to look out for. I don’t doubt much that the mystery is also worthwhile, since it’s the original Hammett story. I’m always more entertained by films of this age than I expect to be, and that goes right back to the character banter. Nick Charles is trying to retire from his detective career to enjoy marriage to his wife Nora, her money, and his liquor. Unfortunately, his friend Clyde Wynant goes missing just after his former girlfriend is found dead, and as much as Nick insists he’s not on the case, the case is on him. Much to Nora’s delight and excitement. Until things get dangerous. I think the main reason the pacing threw me is because I was expecting a whodunnit, which this is not. It seemed like a series of events without much of a plot arc. It didn’t seem like any of the clues were actually included in the web of red herrings, and while the final scene is worth not having been presented with any of the clues, it seems like the villain in Murder by Death was calling out the Nick and Nora parodies most severely when he accused all the sleuths of withholding information from their readers for a more exciting story. What this is is a comedy, and while they don’t monopolize it, Powell and Loy are perfectly cast for the wit and sparring. When they’re not together the film generally returns to the usual slow, empty, wooden mold in which all the most forgettable old films are cast. My chief complaint about their performances isn’t even really about them. The story tells us about Nick’s fighting ability, and we see it in a couple places. It’s the relatively slow, obviously choreographed stuff you got pretty much exclusively until… probably the 50s or 60s. I could definitely picture Nick getting into a Kirk-style fight every now and then, but I’m glad that it’s not so much a defining feature as a detail. He is, after all, trying to get out of the business. This is every bit as good a comedy as I expected, only it’s not a mystery comedy as much as it is a comedy with a mystery hung on it. I’m a little sorry to say I’d probably enjoy at least a few of the sequels, which probably capitalize by having more Nick and Nora and less not-Nick-and-Nora. Watch this movie: for a good laugh with a fun couple. Don’t watch this movie: if a film has to catch your attention in the first scene.